ReneMarine Proudly announces the release of The Schokker! 5a – sets Race id. The Dutch vessel called the Schokker is an unique boat built sturdy and spacious. These boats were commissioned for the Royal Netherlands Navy in the late 1800’s as rescue vessels as well as fishing vessels and a drilling ships. This is a North Sea Schokker. She is sturdy, lean and safe for passengers at sea. This special vessel offers berths in 2 cabins, headroom in the salon and galley, a spacious open cockpit, perfect for a family vessel or for get togethers with friends and colleagues. With detailed rigging and interior work, functional sheet and leeboards, she sails with four aboard. Enjoy the ultimate sailing experience with the ReneMarine Schokker. This is a Mesh boat and requires a Mesh Compatible viewer. RealRudder Technology Steering for the most realistic sailing experience available. * Tiller Movement with 24 Poses that adjust to two sizes of avatars. * NEW AVsitter™ powered sitting system. Any authorized skipper can sit on any part of the boat to be seated as the skipper. Once the skipper is seated then the other passengers may board by sitting on any part of the boat. There are Three Passenger positions on this boat and one Skipper. Sitter 0 is always the skipper. Sitter 1 is the first passenger, sitter 2 is the second, sitter 3 is the third passenger. click on any inactive part of the boat at any time to display the Sitter Menu. 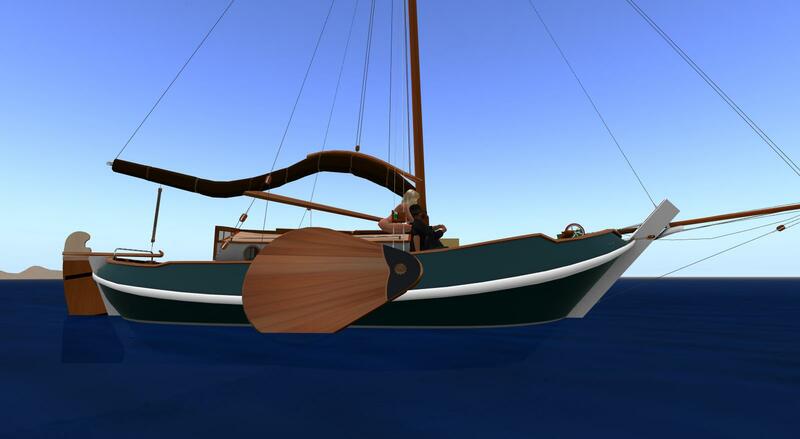 RealRudder Technology Steering for the most realistic sailing experience available in SL. In real life, turning the rudder will only turn the boat if you have forward or backward motion. A boat can go “in irons” when the bow is headed into the wind and the boat has stalled — moving the rudder won’t turn the boat (as there is no forward motion) and getting forward motion is a slow process as the boat slowly falls off (turning away from the wind), the sails fill with air, and the boat slowly begins to move forward again. If you are drifting backwards the rudder acts in reverse. – Then 3 identical panels which can be set to either the main control, or one of 10 different readouts. The boat can not sail directly into the wind – about 30 degrees to wind is the limit. The panel shows which side of the boat the wind is on Red to the Port, and Green to the Starboard. You can toggle between True WindAngle or Apparent WindAngle. The Rudder Position indicator tells you the actual position of the rudder under the boat. NOTE: Press Both Arrow keys at the same time to center the rudder. Note: Shift Right and Shift Left will move the rudder to the farthest position of either side. If you have no forward motion, then the rudder will not affect your direction. You must raise the sails and gain forward momentum and then the rudder will turn the boat. Just like a real sailboat, the sails must catch the wind in order to move. If you lose the wind, then your boat will slow down and stop. The boat will drift backwards when the wind is at your face and you will have to use the rudder to turn the ship so that you catch the wind again. All 3 panels are identical. The last button on each panel is red and toggles the Main Control panel. 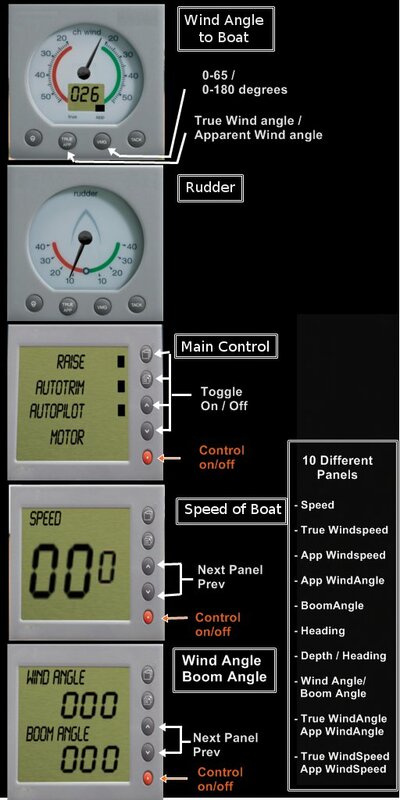 Autopilot lets you lock the boat’s Heading (direction) while sailing. So if autopilot is engaged and you press Left and Right Arrow buttons at the same time. The boat will maintain that general heading. However there is no way to control the slip of the boat as the wind pushes it to the leeward side so you’ll end up having to make corrections. We hope that the autopilot makes it a little easier to control. Up/Down arrows when motoring increase/decrease the throttle. The commands can be entered into Local Chat. * Up/Down arrows when motoring increase/decrease the throttle. when sailing it increase/decrease the sheet angle. * Left/Right arrows control the Rudder to port and starboard. * Shift Left and Shift Right arrows send the rudder Hard Starboard and Hard to Port. * idxxxx / sets Race id. * id off / turns off Race Mode and activates Cruising Mode. * dock – moves the boat to the position set on the boat with set dock. Must be within 10M of that position. boat. Only one alternate skipper is allowed at a time. * alpha – sets the transparency of the Mainsail and the Jib. from the local wind setters. The wind setter on the Schokker automatically receives local winds from the WWC setter that it passes. You can override these settings by issuing the Wind command. Sets the wind speed in knots. So for example wind spd 17 sets the wind speed to 17 knots. Resets the wind to automatic mode so that it resumes automatically accepting WWC from the local wind setters. * idxxxx – sets Race id. * id off – turns off Race Mode and activates Cruising Mode. This boat features the ability to change the camera angle. – Set your desired camera angle. – type the letter ‘c’ into the Local Chat and press enter. – Stand up by pressing the Stand Up button. – Sit back down and press escape to see your new camera angle. The Active Cam offers the driver an adjustable and dynamic perspective when sailing. . The cam pivots to the Windward side when the sail moves with the wind. The position is adjustable on the fly and retains the settings. when pressed simultaneously toggles the dynamic camera adjustment mode. * skipper Firstname Lastname – sets an alternate skipper who can take helm control of the boat. Only one alternate skipper is allowed at a time. 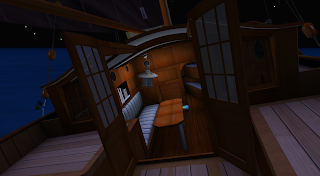 Hull Texturing – The boat comes copy/mod so you can color your boat as you please. Sail Texturing – The sails are copy/mod so you can texture them to your taste. Add numbers and pictures. The RM HUD 2 is the tool that you use to determine the velocity of the wind. The wind indicators point into the wind. When you are relying on the wind for propulsion you have to keep the wind to one of your sides. It cannot be coming directly into your face because then you will lose the wind. The wind cannot be coming from directly behind you because then you are not able to make use of the shape of the sail to optimize your speed. The RM HUD 2 has regions marked Red to the Port and Green to the Starboard within which the RM20 engine will operate efficiently. You have to think ahead of your turns now because the arrow keys are not turning the boat. The arrow keys are turning the rudder and the hydrodynamic action of the rudder is turning the boat. How to sail your boat is a matter of a long lesson in sailing terminologies and wind angles. Much has already been written on this subject which we need not repeat here. You can read about how to Sail your Schokker here on this web page. A note about SIM Borders. Most Sailing simulator regions cover multiple SIMs. The SIM crossings are difficult at best and occasionally disasterous. SIM Crossings can be more difficult the more prims and scripts you’re pushing to the new area. The number of passengers on your boat increases the difficulties of SIM Border crossings exponentially. When crossing any sim border the results are typically unpredictable. That being said, it is best to make use of your MiniMap to identify the upcoming SIM crossings. If you’re going to cross a SIM border it’s best to hit that border head on perpendicular and not at an angle. That way you dont confuse the next sim during the handoff. It’s best not to be turning while crossing a sim border because the handoff will send you spinning. Other things to account for are attachments that are heavily scripted. Collars especially are troublesome. It is helpful to remove your scripted attachments when running your boat across the sim borders. All these are helpful suggestions, but sometimes the handoffs will still be difficult. ReneMarine Yacht Building is happy to provide customers with Support. If you have any questions please send a message to Rene Underby who will be happy to help. Second Life servers are subject to frequent upgrades and SL Sailing can be a challenge in the best of circumstances. When a bug is found in a product and fixed, ReneMarine will offer a free upgrade. No warranties or guarantees accompany your purchases. No Refunds.